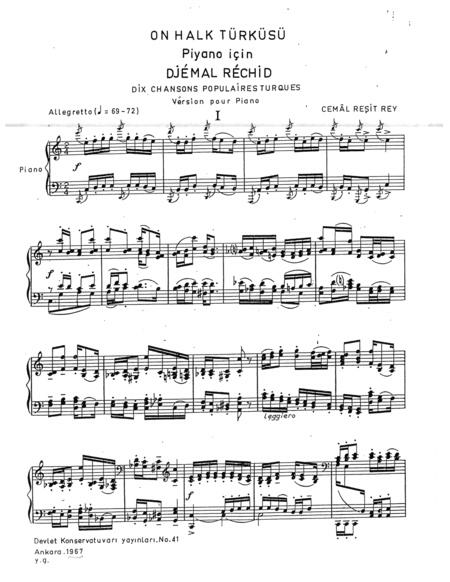 Composed by Cemal Reşit Rey. 20th Century, World. Sheet Music Single. 20 pages. Published by Sonic Crossroads (S0.8086). 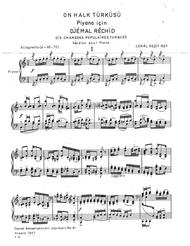 Cemal Reşit Rey (1904-1985) was one of the first generation of prominent Turkish composers of Western classical music known as the “Turkish Five.” He began his music studies at the Conservatoire in Paris where he had spent much of his youth. These pieces based on popular Turkish folk songs were written and published after he moved back to Turkey. They alternate between more Western-oriented tunes and more modal melodies in typical irregular meters as the audio clip demonstrates with the opening phrases of Nos. 4 & 5. (20 pp. ).